Disaster Recovery and multi-datacenter replication of InfluxDB and Kapacitor are two frequently asked-about topics. In this post, I cover some of the suggested patterns for accomplishing this. Additionally, I will discuss the pros and cons of each approach and how they can be combined. In general, there are two patterns that can be used for multi-datacenter replication of data into InfluxDB. The first is to replicate data upon ingest into InfluxDB to the second datacenter cluster. The second pattern is to replicate data from one cluster to another cluster on the backend. The first set of patterns to discuss is replication of data upon ingest to InfluxDB. This is probably the easiest to setup and the most useful for all new data that is coming into our cluster form external sources. Most of these patterns rely in some form on Telegraf. Telegraf is the Swiss Army Knife of the TICK stack and can be used as an agent, a data aggregator or to help setup data ingest pipelines. Telegraf uses input and output plugins. There are about 100+ plugins as of the writing of this post. For a full discussion of Telegraf please refer to the Telegraf docs. In most cases, we recommend the use of Telegraf in almost all deployments of Influx. At the very least Telegraf can be used to batch all write requests to the database; which is something you should always be sure to do. With a list of DataNode URLs, Telegraf will write each batch to one of the URLs in the list NOT to all of them. The DB will handle replicating each batch to the requisite datanodes. This pattern is the easiest to set up. In the case of a network partition between Telegraf and the clusters, Telegraf will attempt to rewrite the failed writes. Additionally, it will store data to be written in an in-memory buffer. The size of this buffer can be configured in Telegraf. When setting this value, you want to make sure that the buffer is big enough to hold data for a typical outage. A good rule of thumb is to set the buffer to hold an hour worth of data in case of failure. Obviously if you are writing a lot of data, this may not be feasible so set it accordingly. This buffer is not a durable write queue; if Telegraf fails or is shutdown, the buffer is gone since it is in memory. So, what do we do if we need a durable write queue? The above example shows that we are using the Kafka Consumer Input Plugin. The topic should be whatever the correct Kafka topic is for our data. The brokers list can be one or more kafka brokers. On each call to Kafka, Telegraf will send the request to only one of the brokers. 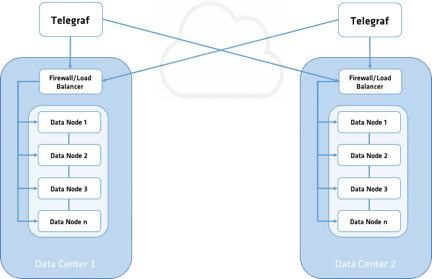 The use of a consumer group is optional, but if you have a large volume of data to pull from Kafka, you can setup multiple Telegraf instances each pulling form the same consumer group. 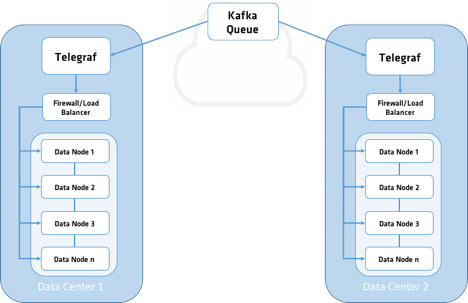 This will allow you to pull more data and not have duplicate data form Kafka as the consumer group will keep track of the topic offsets for each consumer client. The second set of patterns to discuss are those where replication of data occurs after we have ingested data. There are two general buckets that these patterns can fall into. The first bucket is what I call a ‘pass-through’ where we are really just making a copy of the data we have ingested and sending it to another instance or cluster of InfluxDB. The second bucket is for derived data or data that is the output of something like a Kapacitor job, a Continuous Query, or the result set of an InfluxQL query. Subscriptions were originally built for sending data to Kapacitor for stream-based TICK scripts. But here’s a little-known fact about subscriptions: They can send data anywhere you want over HTTP or UDP. This makes them really handy. When you set a subscription in InfluxDB, all it does is forward all input data that matches the database.retentionpolicy you specified. One important thing to note is that the subscriptions on each cluster should not have the same combination of database name and retention policy. This will set up an infinite loop that will eventually tear a hole in the space time continuum; or at least crash both your clusters. The destination for your subscription can be one or more entries. Additionally, you can specify that the subscription send it to ‘ANY’ or ‘ALL’ of those destinations. What this means is that in addition to cross-cluster replication you could also have it send data to another system for other types of analysis or to long-term storage of raw data. Another take on backend replication that is very similar to subscriptions is to use Kapacitor. This pattern would be more applicable for data that is the output of a TICK script where we are either creating new data, decorating or transforming existing data. For example, this is the pattern to use for aggregations or roll-ups of data from one cluster to another. Notice the cluster name? That is not the URL of the cluster; rather it is a named variable from our kapacitor.conf file. More details on the kapacitor.conf file can be found here. # in batch queries and InfluxDBOut nodes. The last pattern to discuss is the good old backup and restore function. It should be thought of as sort of a “sneaker-net” option as it does not operate in near real time. As you may have guessed, this uses the backup and restore commands of InfluxEnterprise. Currently InfluxEnterprise supports backup of all the data in your cluster, a single database and retention policy or a single shard. The first time you use the backup command you should probably do a full backup. However, the –incremental flag is the default, but if there is no existing incremental backups, the system will first do a full backup first. Although this is not a proper cluster-to-cluster replication pattern, I feel it is still worth some discussion. What is the “nuclear option”? This is the last resort option if the whole world, or rather your clusters and all your data, have gone really bad. I should admit that I am a fan of keeping raw data for as long as possible. Doing this gives us more flexibility in our systems and how we might want to analyze things at a future point in time. Implementing this should be done with one of the replication on ingest patterns, where we would tap off our input stream and store all our raw data in long-term storage like S3 or Glacier. Doing this gives us the ability to rebuild our system from source. Hence the nuclear option. If we have all our source data and need to rebuild our cluster from scratch, including all derivative data, we can now do this by replaying our source data. Obviously, there are still some considerations around exactly how much source data you have and the time needed to replay it, but hopefully you see the benefits. In this post, I have discussed several patterns for replicating data between two different clusters of InfluxEnterprise. These are only the most basic patterns, and I think there are probably at least 20 more that exist. I wanted to present a few patterns that you could use as a starting point. The point of this post was not to present an exhaustive list or to say that this method or that method is the best one to use. In reality, there is no single best method or pattern. The best pattern for you is the one that meets your business objectives and fits within your organization’s infrastructure, processes and practices. Now go forth and replicate. Hi, thanks for a great article, please do write more! But here’s a little-known fact about subscriptions: They can send data anywhere you want over HTTP or UDP. However, subscriptions don’t contain authentication information in their HTTP requests. This makes it impossible to use for data replication between 2 clusters with enforced HTTP authentication (unless, I’m missing something). For the time being, this could be worked around using Telegraf as a proxy with http_listener input and influxdb output for each subscription, and with filters applied, Telegraf will route metrics to the proper database. But this workaround introduces extra moving part and a replication delay roughly equal to Telegraf’s interval. Are there any plans to add authentication support for HTTP subscriptions in future? Would it be a part of OSS version, or InfluxEnterprise? Hi, This article is very useful. Thank you for such a great article. I have one question are the above mentioned approaches applies only for Influxdb Enterprise versions or can we use them in Opensource versions as well? Can you please let me know. Thank you.